How many times have you thought to yourself, “I’ve been eating clean all week, I can definitely reward myself.” It’s funny how food can make us forget everything, how hard we’ve been working, the gazillions of articles about healthy food we’ve read, the tell tale signs about cleaning up our diets or the warning signs on our medical reports. We think one piece isn’t going to do us any harm. But that one piece turns into 2, then 4 and the numbers begin to proliferate. We fail to draw a line at moderation. You might just think, we’re set up to fail. Truth be told there’s a reason we can never stop at “just one”. Processed foods have been designed to make you over eat. They’re the “get in my belly” foods that make the happy hormones trump the feeling of satiety. They’re the foods that make your concentration go for a toss. Get this. If you were given one piece of chocolate and the remaining slab was kept in front of you. Would you be able to resist? The temptation to consume more over rides the feeling of fullness. Food manufacturers don’t exactly want you to be whole and healthy, they want you coming back for more. Come to think of it the term, “cheating” is generally used in the negative sense, it’s almost always heralded a character flaw. Just like cheating an exam is considered a cardinal sin, so is cheating your body. Before you shut this tab and swear never to return to this space, no I’m not the nutrition nazi. I’m not here to tell you to live your entire life grazing away like a cow, eating fruits and vegetables. Neither am I here to tell you to give up anything and everything that tastes good, including the perceivably ”unhealthy” foods nor am I suggesting you eat minimally. Because eating a bare minimum is a depressing way to go through life. Always cranky and permanently low. All I ask is you change your outlook. –I’ve been exercising right, I can definitely afford to eat that piece of cake. – I skipped lunch today, I can eat a pizza for dinner. -I’ve eaten my veggies, I can eat that cookie. If you’ve noticed, everywhere we’ve developed this mentality of neutralizing the good with the bad. Yin and yang. Our mindful decisions to eat healthy and nourishing foods have to be counteracted with “cheat meals”. I’ve noticed this time and again. Whenever most people are on a diet of any sort, they look at healthy food as prison food. Food they have to eat to survive. Then they look forward to their weekly cheat meals. They’re setting themselves up to over indulge. It’s like saying I skipped dinner today, I’m going to have two dinners tomorrow. But healthy food isn’t limited to stir fried vegetables and boiled eggs. It’s not about feeling deprived. We’ve got to eat to feel better, move better, live better and definitely be the best versions of ourselves. If you want to have long term success at any diet, you’ve got to adopt one you’ll actually follow, one that fits well with your lifestyle, one that keeps you performing well, but also includes your favorite foods. You don’t need to feel like you’re on a diet. They way we look at things, will greatly alter the way they affect our bodies . Eat healthy cause you choose to, not because you have to. That’s the only way it’ll be sustainable. Eat a brownie because you want to, not because you have no control over yourself, when it’s placed in front of you.Choose to eat healthy, rather than follow a strict diet. There’s no starving and consequently no bingeing, no over compensating. You’re eating healthy because your body deserves it, but you also indulge once in a while because you like to. That’s not cheating, that’s being human. Develop a healthy relationship with food. 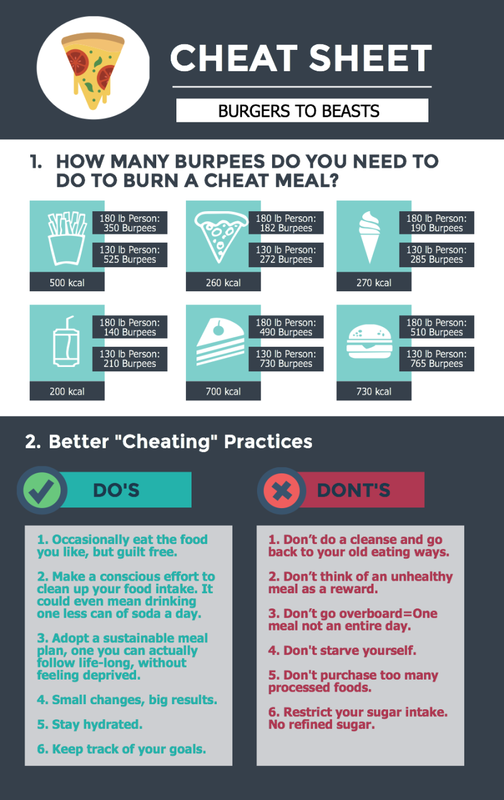 If you look at your cheat meals as just that, you will feel guilty. The minute you rid your vocabulary off the cheat part you’ll be eating because you want to, not because you have to. The food won’t control you anymore, you’ll jut be enjoying something you love. Don’t do a cleanse/detox and go back to your old eating ways. Don’t think of an unhealthy meal as a reward.. Occasionally eat the food you like, but guilt free. Don’t go overboard. If you’ve had an unhealthy lunch don’t make a day out of it. Get back on track with your next meal. Make a conscious effort to clean up your food intake. It could even mean drinking one less can of soda a day. Adopt a sustainable meal plan, one you can actually follow life-long, without feeling deprived.